Denmark has provisionally handed over the Eastern Corridor Fibre Optic Network Extension Project to the Ministry of Communications, which will be managed by the National Information Technology Agency (NITA). 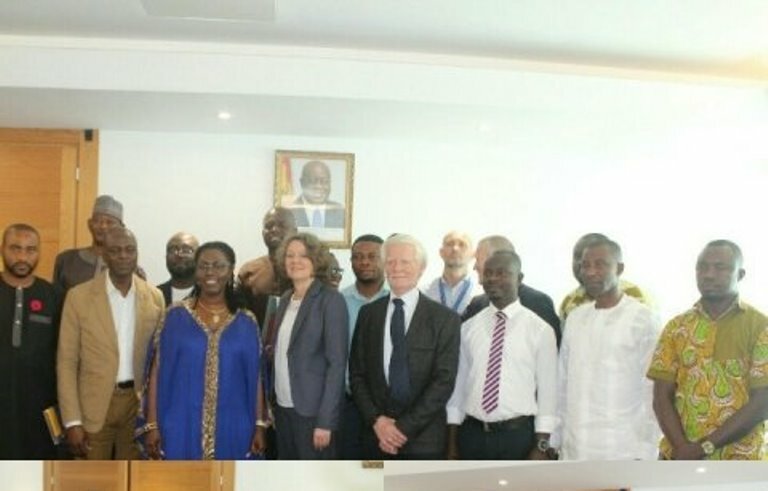 The 165 kilometres, which connects the Eastern Corridor Optic Fibre from Ho to Accra, was financed with a grant of € 3,795, 017 from the Danish Government. The Ho – Accra Fibre Optic Extension Project was executed by Nokia – Alcatel-Lucent Denmark, in partnership with a local subcontractor – Kenpon Constructions Company Limited. The provisional handing over certificate, which had one year warranty was signed by Mrs Ursula Owusu-Ekuful, the Minister of Communications and Mr. Jan Plenge, Export Director, Nokia, in Accra. The ceremony was witnessed by Madam Tove Degnbol, the Danish Ambassador to Ghana; Mr. Issah Yahaya, Chief Director, Communications Ministry; Mr. David K. Gyewu, Director-General, NITA; and Mr. Kennedy Agyapong, President and Chairman of Kepon Constructions Co. Ltd.
Mrs Owusu-Ekuful said, “having an adequate infrastructure on which all digitization effort would ride and having the necessary fibre infrastructure was a Sine qua non (an indispensable condition); adding that no part of this country can be left behind and so this project was commenced”. She said originally the project extended from Ho to Bawku; declaring that “but we noticed that without the metro fibre link from Accra to Ho, we couldn’t derive the optimum benefit from this project”. She said the Eastern Fibre connects 120 communities along the route; and that major towns like Kpando, Jasikan, Nkwanta, Bimbila, Yendi, Gushegu were all connected through that. “Fibre is there, but we do need to work on the last mile to link the communities along the route to the fibre back bone and that we are actively working with partners to develop, then we can derive optimum benefit from that fibre, so that outing communities, the schools, government agencies, district assemblies and health providers will also utilise that infrastructure to update and digitize their work” she said. She said in line with the Policy of the Ministry of Finance, her Ministry would ensure all districts, municipal and metropolitan areas were connected to the national fibre optic network to facilitate the smooth implementation of the Ghana Financial Management Information System (GIFMIS) project. “And so we need to connect the Eastern Corridor Fibre Optic Network to Accra,” the Minister added. Mrs. Owusu-Ekuful commended DANIDA for the assistance that it had been provided to really give effect to the project. She said a lot had been done to secure enough network infrastructure for all the government commercialization or digitization effort and to promote optimum use of technology at all levels. She commended the entire team and NITA technical personnel whose efforts led to the fruitful execution of the project, and urged NITA officials to work hand in hand with the contractors and the commercial partners to ensure that the network was adequately maintained. “No matter how high specification of the network we put in place, if we don’t monitor, operate and maintain it adequately, it will break down, and the investment we have made would have been wasted,” Mrs Owusu-Ekuful stated. She noted that the project was a condition for the implementation of the Ghana Card project and other initiatives such as e-governance and e-health. She lauded the development collaboration between Ghana and Denmark over the past 25 years. The whole of the Eastern Fibre Optic Project cost the Government € 38 million with a loan facility from the Government of Denmark.